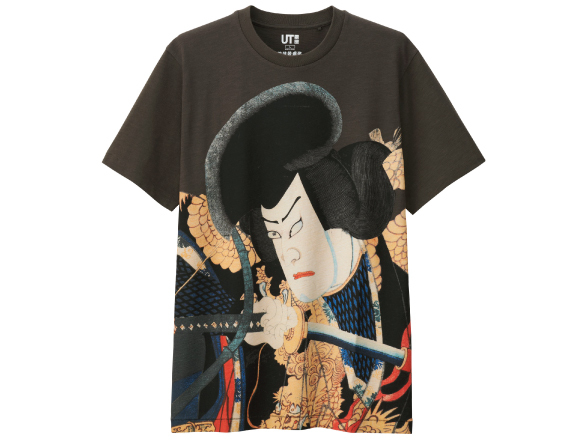 “UT” S/S 2016 collection appeared to be featuring variety of traditional Japanese culture. “Haibara” of Japanese paper shop followed in Nihonbashi, Tokyo two hundred years or more. “Calligraphy” dropped a variety of representations and their beauty of calligraphy into T-shirt. On the concept of the creation of a new Japanese culture “SOU SOU”. The traditional arts that represents Japan “Shochiku Kabuki”. Pay attention to each content. “Haibara” is a Japanese paper shop which was founded in Nihonbashi two hundred years ago. They collaborate with UT for the first time. typical and original products such as “bellows stationery”, Maiko postcard, Chiyogami was put the motif to convey to modern Japanese tradition in the main graphic. Design with the Chinese characters T-shirt is now available at UT. They offered the calligraphy to calligrapher-Kamoda Akanetake and to create a T-shirt in a form close to a real “書(SHOU)” as much as possible under art critic, Onodera Keiji’s supervision. “書(SHOU)” is the theme of old Japanese words and proverbs, selecting the color, the body color and tie-dyed to match the meaning of the word. It comes with a hang tag, which is translated into English about the contents of the design for each print. No doubt that your foreigner friend will be very happy if you bring it as a gift! SOU SOU was featuring with UT previously and got huge attention from not only Japan but in the world as well. Brand name is derived from the word “so, so” which unconsciously is used in daily life in Japan. (means yeah yeah in English approx…) and has developed a furniture, Tabi shoes and kimono based in Kyoto. In S/S collection of UT, Tunic is now on sale as it is the high design.Modern Japanese pattern that was sublimated the tradition of Japan has become a unique feature of SOU SOU. It is always incorporating the modernity while inheriting the tradition, Kabuki continues to fascinate people today. It was started since last year that Kabuki collaborates with Uniqlo and it is happening this year as well. It focus on Kabuki actor fourth generation Ennosuke Ichikawa this time. It incorporates a design inspired by Kabuki paintings and costumes. Among them, “Seven Monkeys” the crest that was designed along with Ennosuke Ichikawa, you can only get it in Uniqlo.